SRetro-R, the new patented retrofit roof system from NCI, is the fastest and most economical solution to your reroofing dilemma. This one-step setup is designed for easy installation over your existing metal roof. Retro-R is cost effective with savings up to 50% over other roofing solutions. And because it is so easy to install, Retro-R will not interrupt the normal course of your business. Retro-R is available in a wide variety of colors or with a Galvalume finish. Let Retro-R save the day, by saving time and money. Fasteners: * NCI recommends a “Long life fastener” * NCI does not recommend self-drilling fasteners. Usage: Retro-R is an environmentally safe, cost-effective retro-fit solution that will cover over the existing leaky roof. Limitations Not to be installed over open framing and requires original R Panel to be structurally sound. Environmentally safe, cost-effective retro-fit solution. Cover over an existing leaky roof. 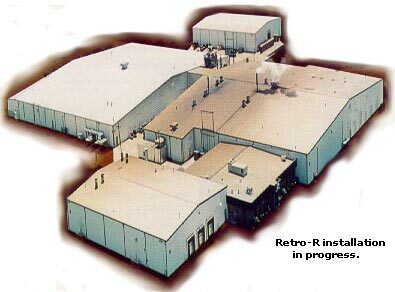 Retro-R is designed to be installed over existing “R” type roof panels. No material tear-off. Retro-R utilizes the existing “R” panel deck to alleviate the need for any additional subframing, structural components or expensive material tear-off. Because of this characteristic, the panel end-lap does not have to occur in close proximity to the structural roof support. Factory applied vapor barrier. Designed to reduce condensation. Installation is easy. Existing roof is a solid work surface which reduces labor costs. Cover existing out-of- module systems. Sloves difficult situations.